Cupping is probably the most topical and viral treatment option in medicine right now, period! Thanks to those characteristic circular bruises Olympic legend Michael Phelps has been sporting it seems as if every media outlet is covering stories surrounding this treatment option. The technique of cupping can be dated as far back as 3000 BC. Rooted in Traditional Chinese Medicine (TCM), glass cups are used to create suction on the skin. 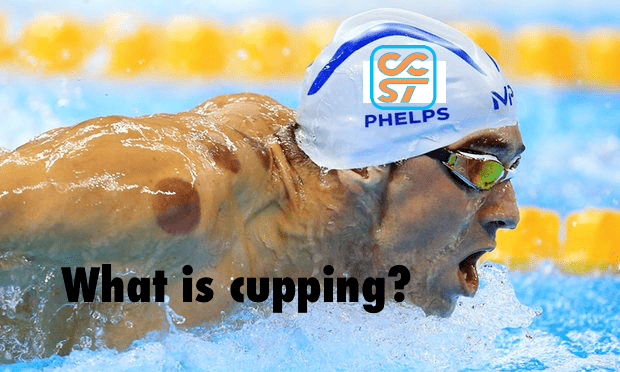 There are several different ways in which cupping can be applied, such as dry, wet and fire cupping. Cupping is said to increase blood flow, and stimulate qi (which TCM describes as life force) and draw “toxins” out of the body. There is little doubt that cupping increases blood flow as you can literally see it in action. The jury is still out on the qi and toxins thing but let me say that applying any sort of suction to the skin for greater than 2-minutes will very likely result in a bruise; I believe the technical term of “hickey” can be used? I have always had a problem with the whole debate on what are “toxins” as I have never seen or read anything, scientific or otherwise, which describes what a toxin is. Like I said, any suction greater than 2-minutes will cause capillaries in your skin to break and thus release blood causing a bruise, not a release of toxins. Whether this act (of creating a bruise) actually creates a healing effect is scientifically unknown. However, I personally use the use of suction cups in my clinic with great success. I use silicone cups in my office (applied much easier) and I choose to not leave the cup on any one spot for greater than 1-minute. Instead, I choose to place a lubricant on the skin and move the suction cup up, down and across the skin to solicit the effect of increased blood flow and to also mechanically lift the tissue via the act of suction. By moving the cup you allow the tissues to be pulled and tensioned in a fashion similar to a massage. The scientific evidence on the benefit of massage is clearly proven to be effective for pain relief and healing; thus a very clear correlation can be made between cupping and pain relief/healing when you are moving/gliding the cup over an area of tissue. It actually feels quite nice, like a deep massage and very rarely causes enough of a sustained suction to leave a bruise. What’s more is that gliding suction cups across an area of tissue falls in line with treating fascia or kinetic chains when applied correctly. When applied in a manner where the cups are moved and only on the skin for under 2-minutes the risk of side effects (like bruising) are very rare. Ultimately, I think cupping is getting a bad rap for not being scientifically proven to work, but keep in mind, this is along the context of proving that qi and toxins are involved in the process. This supernatural idea of qi/life force is the main downfall for the overall acceptance of cupping in western medicine, along with poor quality research and study design. It is important to consider though that if the most highly decorated and arguably the best and most dominant athlete of all time feels like this technique works, there is probably something to it. Cupping has been used all over the world for millennia so although the evidence might not be clear on its effect, there is a proven staying power of this treatment modality that must be respected and confer some degree of credibility. In my humble opinion, cupping is best to be considered and grouped as a soft-tissue/massage technique that allows for the mechanical stimulation of the tissues that are being treated. My personal recommendation is to move the cups around rather than allow for bruising to occur (as bruising is a marker of tissue damage/injury). Anecdotally, I have found this to be a very successful treatment option, especially when it is coupled with other soft-tissue therapy techniques. NW Calgary Chiropractic, Physiotherapy and Massage.